Why Do Some Dogs Prefer Women to Men (and Vice-Versa)? If you’re a pet-friendly dog owner, you’ll know that dogs have very unique personalities. It’s common for certain breeds to display certain personality traits. For example, golden retrievers are known for their affectionate, placid demeanors; bulldogs are known for their laziness, and border collies are famed for their intelligence. However, any dog lover who has ever owned multiple dogs of any breed will understand that breed alone doesn’t account for a dog’s personality—far from it. For example, in a home with two border collie labrador mixes, you can have one dog who barks at fireworks and thunder while the other prefers to hide under a table or a desk. 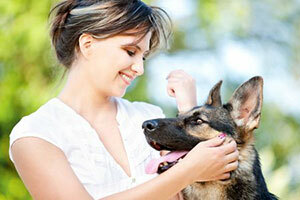 Other factors can also determine a dog’s personality, like their environment. However, even dogs who share the exact same environment still have some divergence in personality. Like humans, dogs have an essence of personality that doesn’t come from genetics or environment. This is why we encounter some dogs with eccentric habits, like sleeping on the bed with their head on the pillow just like a human. Other eccentric habits that a dog may adopt include sleeping in the most uncomfortable looking positions, howling when the phone rings, and rearranging their blanket when they’re about to get into bed. These are cute and lovable eccentricities, so it’s no wonder that over sixty million American households own a dog. While it is not a hard and fast rule, some dogs prefer women to men (and vice-versa). It is difficult to broach this subject without drawing on gender stereotypes. Might we speculate that many women tend to be more soft-spoken than men? Some dogs prefer soft-spoken voices over loud, booming ones, so some behavioral characteristics like this may be to blame. Submissive breeds who are more used to female company may become alarmed when they encounter a male stranger. Still, the same applies when we reverse the genders. Conclusively, socialization is key. 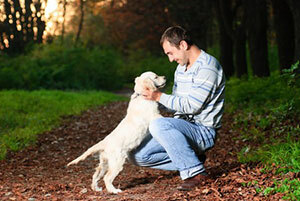 When the dog is a puppy, it bonds the strongest to whoever is its primary caregiver. This occurs up until the six month mark. This is why all dog owners are better off getting a dog when it is as young as possible. If you get a dog and it’s already a year old or more, you have no idea what its key socialization period was like. Its previous owner could’ve had some strange habits or there may have been abuse. Walking blind into dog ownership like this will often mean that you will have to work a lot harder to iron out bad behavior. It should be noted that this is not to discourage dog lovers from adopting shelter dogs. If everyone out there only wanted a puppy, the shelters would be even more cluttered than they already are. Dogs are worth the effort, even if we have to work that bit harder to re-socialize and retrain them. Dogs don’t really have a preference for hair color, unless their experience has been severely limited and they have only encountered people with one hair color. This is unlikely, unless you never leave the house and your entire family has the same hair color. If this is the case, then yes, your dog may become wary or frightened when they meet someone new who has brown hair instead of blonde. Still, this is not a strong determining factor with regards to a dog’s affection. They might also be wary of people with sunglasses or hats because both items hide the facial features to a degree. A dog assesses a face, so they may be wary when someone is unintentionally hiding theirs. The height of a person can also impact a dog’s reaction to them. First and foremost, a very tall person may intimidate a dog. There are ways of getting around this, however (since you can’t help what height you are). When attempting to socialize with a dog who is a stranger to you, should should always kneel down and allow them to approach you. Some people wrongly assume that overbearing friendliness wins a dog over. In reality, looming over a dog, giving them eye contact, and spreading your arms open wide to give them a big cuddle will actually frighten them. Height isn’t everything, though. Children are small and many dogs are uncomfortable with the fast, erratic movements a child makes. They also tend to do annoying things like poke the dog’s eye or pat its head roughly. As a result, you should always be wary of dogs who haven’t been around children, as they may react aggressively if a child it meets invades its space. Thus, height might be a factor in determining whether a dog will assess you positively, but there are men who are over six feet who are almost like Dr. Doolittle because every dog they meet loves them. The way you approach the dog, your general vibe or energy, and your general personality are stronger determining factors than height. It is a lot more difficult for a mean person to become amicable than a tall person to simply kneel down. While it is true that gender can affect a dog’s affection towards you, this doesn’t mean that you should give up on them completely just because they happen to be a breed who prefers the opposite gender. It doesn’t matter what gender you are. If you are consistent with your affection and disciplinary techniques, your dog will soon learn that you are it’s master and will develop a strong loyalty towards you. Still, many dog owners don’t truly know how to discipline a dog. Bad behaviors set in when they are puppies, and when your dog is just a little ball of fluff it’s discipline to tell him or her to get off the furniture. When a dog is young, it assesses how firm you are. If you can’t discipline your dog without laughing, they’ll soon realize that they can pretty much get away with anything they want. Yes, it can be difficult to discipline a dog consistently (especially a really cute one who likes to paw you right in the middle of your trying-to-be-angry mode), but it’s essential to realize that clear signals actually benefit your dog. If they do the same thing wrong twice and get two different reactions they won’t have a clue what is actually expected of them. Thus, even though you don’t want to be ‘mean’ to your dog, chastising them with a clearly authoritative voice will teach them that their behavior simply isn’t acceptable. The best pet-friendly places to live in Northern Virginia are Fairfax, Chantilly, Centreville, and Arlington. All of these locations have communities that are pet-friendly. Some areas charge extra fees or have certain breed or size restrictions, but it’s wonderful to know that even single professionals looking to live in an apartment can bring their furry friend along with them!